Do you have a 55 gallon drum or trash can to put under it? I just know on my older Johnson that it needed it be in a larger container for the water cooling pump to work properly. Once it fires, make sure you have good water flow or shut it down. If the motor has not been run in a long time, I would not attempt to start it until the water pump impeller has been replaced. or worse yet, may have pieces of the vanes break off and become lodged in water passages in the engine block. Also, bear in mind, never run an outboard without water. Even a few seconds running without water will destroy the impeller. Probably, the motor will need the carbs rebuilt, and ignition tune or ignition parts replacement. Sounds like good advice and feedback Bill, Thank you. I added the additional INterlux coats of paint on the transom and like the way it looks. I also went with FLag BLue color which is a deeper shade of blue which I also like. Greetings to all, I am still alive and mostly well and now with a first Grandchild so Life is full of activity. I am still trying to finish my boat which I think is about 95 percent done. I left off last year early fall with redoing the transom paint with quality Interlux Brightside paint which looks a whole lot better but I still have the rest of the hull and cabin to repaint. I also would love to hang my old Bearcat motor on the transom now that it is repainted so I can hook up some steering etc.but the boat is hard to access where it is located in my backyard with a heavy motor and I am not as strong as I once was. I also have some cabin interior details to do but other than that I could put her in the water. So I will try to make some progress this summer. My wife is very frustrated with me and thinks I should just get rid of it because I am never going to complete it etc. But I will continue on non the less. Your so close! Hang in there, you will be cruising it in no time. It looks beautiful by the way. Hang in there Craig. Remember all the other times you encountered difficulties and got through them. You're so close now. I would personally love to see you get her in the water. Thank you guys, I am trying to come up with or build a cart to haul my motor out to the boat (not so good rolling surfaces) so I can hang it on the transom which will really get me going on completion plus I will gain extra room im my small garage. Perhaps you know about this already, but the http://www.fiberglassics.com site has a forum section specifically for Bearcat outboards. I use to be a member of some of these groups and there was some good feedback on these Bearcat motors but getting to meetings and getting to know some of the folks was difficult due to distance and lack of time to attend so getting any real one on one help wasn't possible. 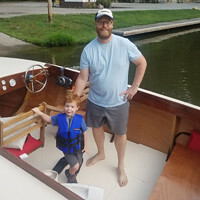 It has been a busy month with family activities but I will start to work on the old (6 yrs now)boat before summer ends. Just need to hang that old motor and install the steering system and some instruments etc. I have been trying to decide on how to install my homemade Mast. I am thinking a couple of dowels into the windshield frame and maybe a thin base that a single bolt or quick detach pin or something could attach it to the cabin roof. I want a detachable system so I can remove the entire upper windshield etc. for storage. Any Idea's Folks?? Hey Craig, nice to hear from you again. I am planning on mounting my mast a bit further forward and considering hinging it so that it will lie flat. Since I plan on having "wings" on my mast, I am not sure yet how that is going to work. I am still quite a ways from worrying about the mast as I have yet to even start on the cabin roof. But since it will contain the anchor light wiring, provision will need to be made for that in addition to storing the mast. And don't feel bad about 6 years. It's 6 years for me too and I am much farther behind on my build. There is a bucket load of things that need to be doe to these boats. Craig! Good to see the Sea Knight again. Looking great!